IPv6 was introduced in 1994 and has been in development at the IETF for over 10 years. It has now reached the deployment stage. KAME, the de-facto open-source reference implementation of the IPv6 standards, played a significant role in the acceptance and the adoption of the IPv6 technology. The adoption of KAME by key companies in a wide spectrum of commercial products is a testimonial to the success of the KAME project, which concluded not long ago. This book is the first and the only one of its kind, which reveals all of the details of the KAME IPv6 protocol stack, explaining exactly what every line of code does and why it was designed that way. 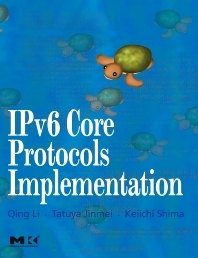 Through the dissection of both the code and its design, the authors illustrate how IPv6 and its related protocols have been interpreted and implemented from the specifications. This reference will demystify those ambiguous areas in the standards, which are open to interpretation and problematic in deployment, and presents solutions offered by KAME in dealing with these implementation challenges. Tatuya Jinmei, Ph.D,a senior software architect at Internet Systems Consortium, Inc. He had been a core developer of the KAME project since the launch of the project through its conclusion. In 2003, he received the Ph.D degree from Keio University, Japan, based on his work at KAME.